Happy Election Day! I hope you get out there and make your voice heard (like I did here!). Without trying to rub it in everyone's face...the weather in SF has been just crazy amazing right now. Unfortunately, it makes for sitting indoors in an office less than appealing but, a girl's got to fulfill her obligations! Despite the sunshine, I elected a dark look. 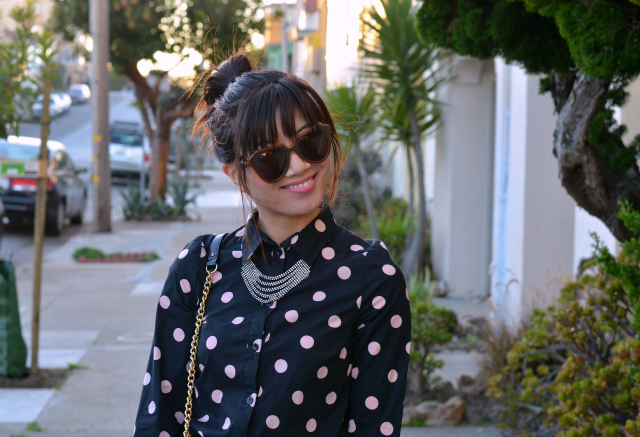 This polka dot shirt is still one of my favorite $5 finds from H&M. It's 100% cotton so the breathable fabric was just right on a warm day. I buttoned the shirt to the collar so the short skirt balanced out since I covered up on top. So without further ado, I'll continue to enjoy the sunshine through my office window... #firstworldproblems. happy election day to you as well, Nancy! And as usual, you look stunning! Love your polka dot top! Such a cute outfit. I have nothing to say other than the fact that you are too cute. Loving the polka dot top and leather pumps. Too cute! You look really beautiful, lovely manicure) well done)!!!! What a great post, thank u for share! This is such a beautiful outfit! The weather in FL has been great lately too which has made my family and friends at home (in Ohio and PA) quite jealous. LOVE those animal print heels + your sunnies! Lucky you have sunshine, it's freezing here! Fab outfit! Very cute election day outfit!! Can't believe you got that shirt for $5! Check your email when you get a chance, doll! you look gorgeous!!! jealous the weather has been so nice there - it's FREEEEEEZING here! love the black and white with the leopard heels! Also love the emerald/silver nails! Such a great outfit! I really love it, especially that shirt! I super like your style! The top and the bun of your hair is adorable! :) New follower here..
love that rm bag. you look gorg! xO! loving everything about this outfit & the way your hair is styled!! How in the world was that gorgeous blouse a $5 find!!!! I LOVE that the polka dots are pink!! TOO cute darling! I was so proud to walk out with a "I voted" stick in hand. First time voting, and I will always be grateful to the women before me who fought to give me this right to vote! you styled this outfit so well! love your hair up with the bangs! so cute! Love your polka dot top and cheetah print heels! Loving the shoes, they're quite amazing! What an awesome $5 find – jealous! Also jealous of your 80-degree weather. I'm headed to SF tonight and it looks like I'm bringing the cooler weather with me ... sigh. Wow, I never thought of pairing polka dots with leopard, but it looks fabulous! This is such a chic look. And I want your bag! Love it. Now way! You got this top for $5??? Score! Love it and this entire look...very chic and sassy! Well done! I love everything about this outfit! HAHAHA The top, skirt, shoes, purse and EVEN YOUR FUN NAILS. Great job Nancy! Yep, I voted! how adorbs are you? 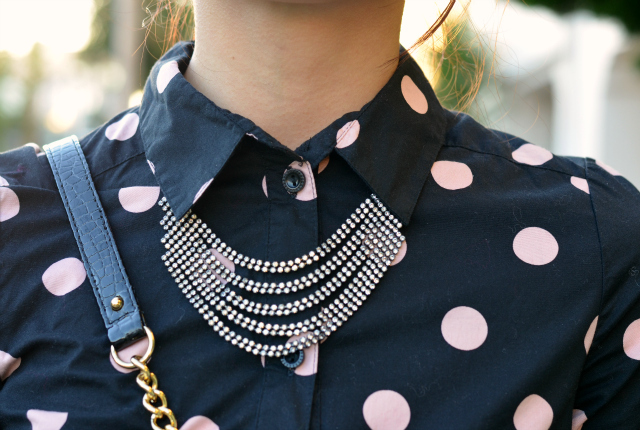 love the dots and the layered necklace! Obviously swooning over that bag too! this is such a fun look - i love the pattern mixing and your fun manni! oh my goodness I adore this entire outfit!